Finally made it to Topshop / Gee Whiskers! I finally made it to Topshop in Cape Town, but being a beauty blogger I naturally headed straight for the makeup stand. I really love the packaging. 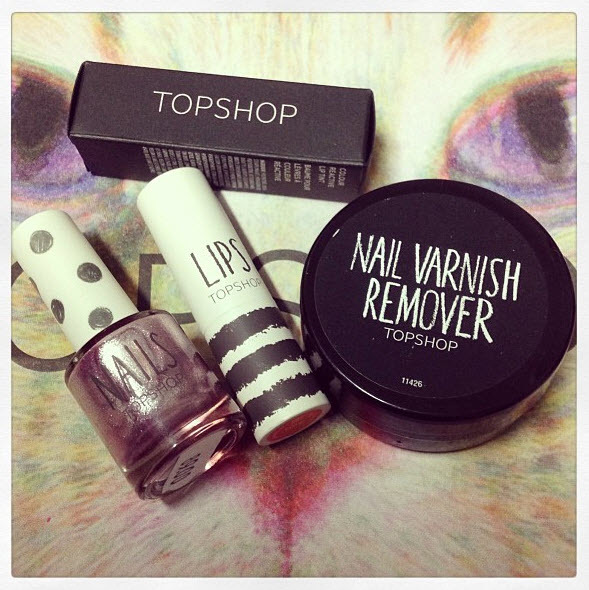 Topshop Nail polish, Lip tints and Nail varnish remover pads. I was really pleasantly surprised by the products available and the price thereof. Nail polishes retail for R89, Lip tints are R113 and Nail Polish remover pads are R29. There are also makeup brushes for just over R100 each; Smokey eyeshadow palettes R249 and lipsticks around R139. I will be posting full reviews very soon of all the products I bought. So far I have had the nail polish on since Saturday and it has only chipped off one nail :) Very impressed so far. But the store doesn't have any winter nail polish colours in - mostly neons. Cannot wait to read the reviews! So happy you finally got to find some Top Shop goodies. Looking forward to hear what you think of all the products! !